"Be realistic: start small, with something that can work within a reasonable time frame. And expand later. Don't start something that is impossible to finish." Hello there Steph and many thanks for accepting to be interviewed, much appreciated. We know each other quite well I would say (having shared the duty of running the Modding Awards for some years now), so I really don't need any introduction, but for the sake of our audience and of the many guests that visit Total War Center, would you mind telling us some words about you and what do you do here at TWC? I've always been interested in games. Starting with boardgames, wargames (such as the Cry Havoc serie or Advanced Squad Leader), and Role Playing Games (the pen & paper version), but not only to play them. I also liked to analyse, understand, adapt and try to improve the game mechanism. For example, between 15-20 years old, I wrote my own RPG game system. 800 pages of rules. It still lurks somewhere on the internet! I was also interesting in History, and had a large collection of plastic toy soldiers. When I was a child, it was just to play, but then it turns more into a collection thing, and I started to paint them. This collection/painting phase was focused mostly on Napoleon period, with a few exceptions. As a late child (I have a brother and sister who are 10 and 15 years older than me), and the "smart guy with glasses" at school, in a rural area where most guys were interested mostly by soccer, I was often by myself, with few guys to play these games with. So my interests switch more and more to computer game, still with a focus on RPG/strategy. At least the computer was always available for a game when I switched it on! I started modding computer games with Civilization III. I made an extensive mod for it, and when doing it I got frustrated with the poor editor that shipped with the game. So I made my own, a much more powerful one, and also some helping software to help generated unit graphics, converting output from animation software (such as Blender) into the format of the game. I believe 90% of the unit graphics for Civilization III mods at Civilization Fanatics Center (and that's more than 8000 units!) where made using this tool as some point in the process). I tried to get in contact with the game editor to get a way to make a kind of unofficial patch to improve the game, but after initial good contact, it was suddenly broken. That's more or less stalled my interest with the game. And at the time NTW was released, so I switched to that. Initially I just played the game, but although I think it has strong basis, it had some limitation, so I looked for mods. It started with Bart's, to get more units and AOR, and then to l'Aigle and his beautiful uniform reworks. I contacted him to see how I could help, discovered he was also French, and so we got in very regular contacts, and decided to start Masters of Europe, a completer overhaul. At first, he did the graphics, I did the database edit. And progressively I learnt how to do the graphics myself. When he lost interest in NTW, I completely took over. And I've kept working on it since then. I have 1600+ hours register on Steam for NTW, a lot more than any other game (second one is Skyrim with 900, but shared with my two children!). And a very large part of it is spent testing the mods, correcting flaws, and trying new ideas. I see, so we can say that modding is your life here at TWC; Why did you chose Napoleon amongst the many titles? Have you ever thought of modding Empire as well? I started with good old Shogun, when played Medieval, Rome, Medieval II... I did enjoy them, but just played them as they were, without feeling the need to mod them. Then came Empire. Although the game looked ambitious, I found some flaws in it. Like the actual lack of diversity from one faction to another (just colour changes). But there was a game blocker issue for me. The map. I couldn't understand why France had only two regions for example. So I did not really try playing the game. It felt too... unfinished. And I was still very busy with Civilization III at the time. When NTW was released, I was really pleased. As I told you, I collected and painted Napoleonic figures. I love this period. Uniforms are colourful and dashing, and so much happened in such a short time. And CAD did a good job: that was the first game with a real difference between national uniforms and armies. And I liked the game engine: the speed and flow of the battles was nice. Shogun 2 was good too for that, but I was disappointed with Rome 2 for example. So NTW in my opinion combines a time period that’s one of my favourite, a good gameplay, and good basis in terms of uniforms quality. But there were some flaws… So I started to walk the long path of modding to correct them as best I could, and improve the game. Although there are many limitations, and a lot of frustration, I stuck to NTW. I didn’t try modding Shogun 2 or Rome 2, because although I like the games and periods, that’s not something I feel compelled to mod. I play the game as they are (for Shogun) or with mods made by other (for Rome 2). Some suggested I tried to remake my Napoleon’s mod with these engines. But first I think they also have their own limitations, and it would requires too much work, or large missing parts. For example, if I want to use Rome 2 to get a better map of Europe. Suppose I manage to have musket warfare to land battle, if it’s even possible, it would be strange to have naval battle with galleys! So it means redoing everything: land units and battles, ships and naval battles… but also buildings, etc. So I decided to stick to NTW and NTW engine. To be an epic modder, one needs also to be a fan of history, or that's what I learnt so far; considering the many generals/leaders that lived in that period, which one is your favorite? Any other historical character that you find interesting/inspiring for your modding work? I’ve always been interested in history. That was one of my strongest field at school, and I have interested in every period. But with a particular focus on the Napoleonic eras, mostly coming from my figurines collection and painting time. My favourite character of the time is of course Napoleon. Not only because of his prowess on the battlefield, but also for the impact he had on France history. We still have many things in our every day life or organization which are coming from then (like the civil code or the Préfets). There is also another general that I find really interesting, and his portrait is my avatar here at TWC: Antoine Charles Louis de Lasalle, the archetype of the hussar of the time. But this is more for general interest on the area. It has little influence on modding. Modding work is influenced by a general interest in the uniforms, not a specific character. What's your main source of inspiration to mod? And why have you decided to start to mod TW games? There was also a lack of immersion. CA did a good job adding national language, with soldiers speaking in German, English, Russian, etc. Except they speak the language of the controlling faction. Play as Russia, capture Portugal, and then you can recruit Russian soldiers in Portugal, speaking Russian! So my main goal when starting the mod was to correct and complete army rosters and uniforms, have a full AOR mechanism with allies, and with a strong immersion, through languages. What's you main modding project then? Can you please give us an insight about it? Here at TWC it's obvious, as I have only one with Masters of Europe. It is however a very ambitious project, especially since it's basically a one-man team project. I started with l'Aigle, but I've been working almost alone on it for years now. I've got some very good help from others, such as Sirlion or Trig recently, but it is usually for a rather short time, and one specific issues. The key point for the mod was to completly rework the unit rosters, to remake every units for every faction, and stay as a historically accurate as I could. Another important criteria for me in consistency. I want the whole mod to feel as a large consistent game, where the different parts are integrated smoothly. So if I start to mod a faction, I need to do all the others in the same way! 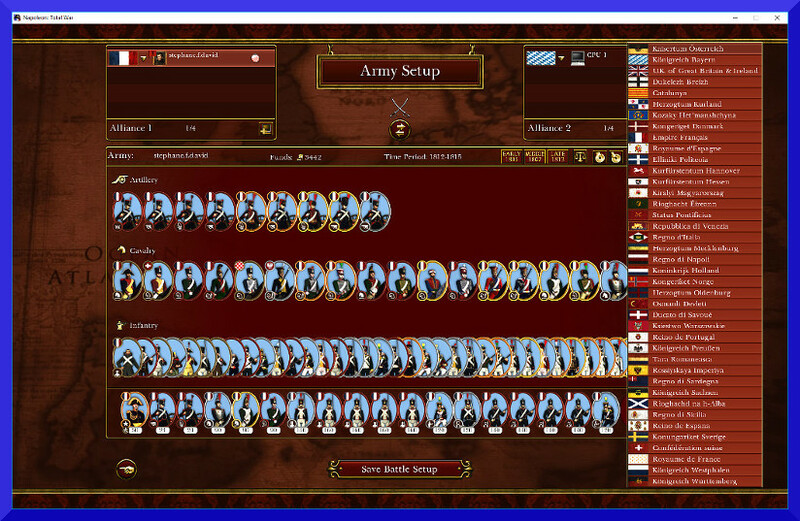 First, I changed all the rosters, to have historical units, based on historical regiment lists. I remade all the uniforms, including texture changes, but also new meshes for some unit parts. When necessary, I've made several versions of the uniforms, to portray different time periods (up to 3 periods for some factions). 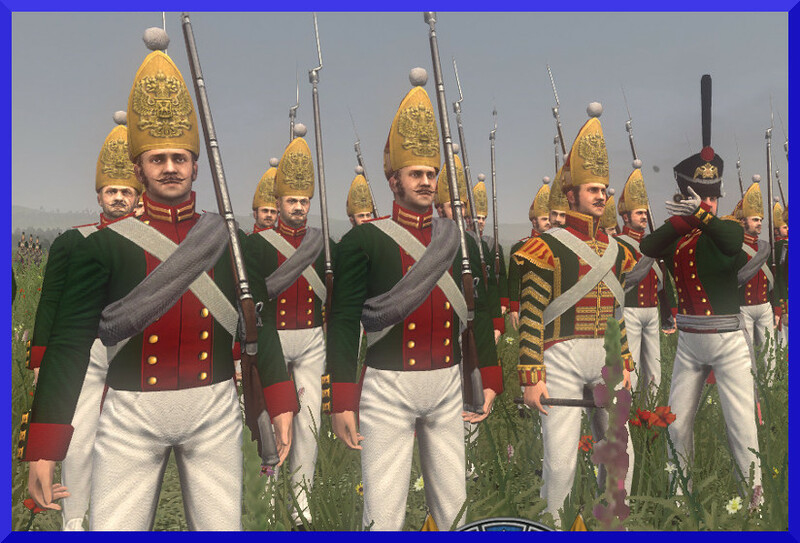 So Prussia start the campaign with bicorns, but end he campaign with soldiers wearing shakos for example. I edited the uniforms, but also the saddle cloths of the horses, or artillery, or the paint scheme of ships. To have nice consistency, I hand-made all the icons and info card with a standardized style. I also edited all the voices, to have each unit speak its own language, whatever the recruiting faction. Play as France, recruit Bavarian units, they'll speak German. Play as Britain, recruit Portuguese soldiers, they'll speak Portuguese. I made some adjustment to the unit and battle parameters. Correct and detailed uniforms with 3 periods, units speaking their language, and with an option to have all the unit names in their own language as well, give in my opinion the best historical immersion available. Second, I wanted to put a strong emphasis on allies. Napoleon's army had of course French at the core, but it was supplemented by many Poles, Bavarians, Saxons, etc... Wellington at Waterloo had a large contingent of Dutch and Belgian soldiers, etc. So I made a complete Area of Recruitment (or AOR) mechanism, where you army is limited. You can only recruit your national soldiers in you home regions. In occupied regions, you can only recruit local troops. Occupy Wurttemberg with Austria, and you will not be able to recruit Austrian troops there, only Wurrtembergers. This also applies to major factions: if Britain captures Nromandy, they won't be able to recruit British units, and not even French units with their blue coats. They'll get access to French royalist with "historically acceptable what-if white uniforms". The AOR system is not only used to force a faction to recruit local troops, but also serves to define the size of you army. Each region allows a faction to recruit more toops. As France, lose Normandy, and your line infantry limit drops by 4 ! Third, I reworked the buildings and the tech tree. In the vanilla game, with small cities with only one slot, you can only have one building. So Wurttemberg for example can recruit infantry/cavalry, but no artillery or militia, because Munich can only have a barracks, and cannot have the administrative center or the artillery building at the same time! I'd love to have the mechanism from Shogun 2 or Rome 2 available in NTW, where a city can grow to give more slots, but since CA didn't implement that at the time of NTW, I had to come up with new ideas to allow each faction to get access to every types of units, even in one slot cities. 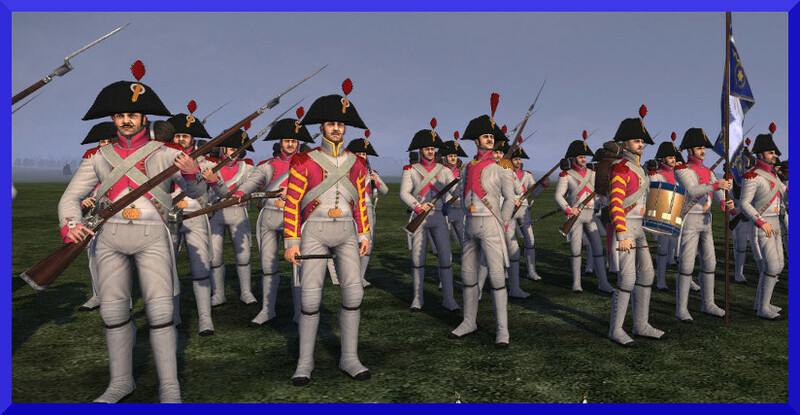 What's the point of making a full roster for Wurttemberg with new uniforms if you cannot recruit them? There are also a lot of other small things, but these 3 points are by far the most important ones. What do you think is the most important if you want to make a large mod such as MoE? - Be realistic: start small, with something that can work within a reasonable time frame. And expand later. Don't start something that is impossible to finish. Tha'ts why I stuck to NTW engine, and didn't try porting the mod to Shogun 2 or Rome 2 engine. There would be so much to redo (including ships, buildings, etc.) before tI could consider the mod to be done that I'd probably have finished this after CA made NTW3! If I ever could finish. Being ambitious is good. Being too ambitious is not. - Be organized: for a large mod, you need a good design first, with research, Excel spread sheets with all ideas. Then you need to be careful with the naming of all the units, variants, images, so you can easily find them and correct things. The unit table alone for Masters of Europe has 4956 lines. You cannot just open PFM, go to the unit table and start editing. You have to plan, define a work process, and follow it. - Be ready to fail: there are many limitation in CA engine. Things which are hidden, hardcoded. For every idea that worked that went into Masters of Europe, I had 5 ideas that I tried, and failed. I spent hours trying something, which I have to abandon at the end. This can be very frustrating, and you need to be prepare to that if you don't want to quit your project in the middle of it. - Compromise: we have to work with the engine. We can try to find new solutions, but when it doesn't work, don't fight the engine too strongly. You are likely to lose. Find another solution. Or reduce your ambition. Learn to compromise: when a detail you wanted to add doesn't work, move forward. Don't look at what doesn't work, look at what is working! - Stay true to yourself and be consistent. When you release something, you'll get many critics. You need to listen to all of them, some can be helpful to improve your work. But others are expression of different preferences, and you cannot contend everyone. so if you want to reach the end of your project, you need to keep the big picture in mind, and remain within your global design. Someone may not like a detail, but if the detail is important to you to fit in your global view, keep the detail! If someone really doesn't like it... point him to PFM so he can change it himself. Any other minor project you wish to talk about or that you are particularly fond of? Not really, everything I do is part of Masters of Europe somehow. Thee is a "side" project I'm working on at the moment. It is also related to Masters of Europe, but not part of the mod itself. I plan to make a new type of installer. Masters of Europe has many files, and due the total size, I cannot afford to make a big install package, and upload it again every time I change a small things inside, to correct a bug, add a new features, or balance something. So I have many small files and it's sometimes tedious to install it or keep track with the changes. So my plan is to make an installer that would automatically check your installation, and download and install missing or modified files. I assume that with you experience you must have given out quite a lot of support to other modders; any tutorial or tool that you created? Anything in particular that makes you proud? I often see questions in the NTW section of the forum, and try to answer the best I can. I made a tutorial explaining how to manage the atlas files where you have all the uniform textures, if you want for example to use a coat from a faction and use it for another. It's not very complicated... once you know how to do it! Of all the material you have produced, what's you favorite work(s)? That's hard to select one... I've proud of all the uniforms I remade, as a whole. It's the consistency of the global mod, with every uniforms redone that makes it good, not only one specific texture. I'm also happy of the immersion brought by the voices in their own language. That's a lot of work. The XML file with the unit voice configuration alone is more than 80k lines long! And one "small" thing I did almost at the beginning: I believe MoE is still the only mod where, for custom battle, you have a button to select your period, and thus can play with different units/uniform. Not only you can play with every faction, including the minor ones, but you can play at different time. Play as France, and you'll get different uniforms and units in 1805, 1807 or 1812. You know I respect you pretty much as person and as a modder, so I'd like to listen from you what do you think of the HELP project and what could/should have been done to make it successful? I did not follow it very closely. But I've seen in the NTW section, that when I have questions about things I cannot make to work... very often there is no answer at all, meaning no one has found the solution. I don't think the form of the cooperative works matter a lot here. What we would have needed is real support from CA, there are limitations they are the only one who could help us with. Another big limitation is commitment on a long time. People can come, propose some help. For a few months. Sometimes a few days. It's very difficult, at least for me, to have someone helping on the long run. What's your main complain about modding Warscape Engine? There are so many limitations! I don't know where to start. Things which are not doable. Things which are very tedious to do. Or that should work... but don't... I actually sent a document to CA with suggestion from my modder point of view. Unfortunately, I didn't get a feedback from them. It would be much easier if the campaign map was build dynamically from the DB, and things like the number of slots could just be changed in a table there! Another big constraint is hard coded stuff. For example, I couldn't add a new unit class; it crashes the game. I cannot add an agent to convert people to a new religion: everytime I tried, I could add new agents... but they stubbornly refused to do any conversion, until I had to shot them dead for treason ! The use of only one atlas with all the textures for a faction is also a constraints. I'd rather have a system where each texture could be an individual file. What's your opinion about new non historical (fantasy) titles? I haven't played yet, but as an old RPG player, I don't mind them going for Warhammer. I'm actually waiting for the next good sales to grab Warhammer. And will probably get the II since I'm partial to elves . As a side note, back when I was painting figurines years ago, I painted my own chessboard, where half the pieces are High elves, and the other half Empire soldiers. What are you hoping for about the next historical title? - Full map of Europe with a working map editor. All these so I can make a MoE 2!! And the frosting on the cake: if CA implements a suggestion I sent about two level for the units: regiment at the strategical level, when recruiting units in the campaign map, auto deploying into several companies in the battle map! What do you expect from your modding future? Except if the new historical title brings new possibility, I still have work to do with MoE. I have a few factions that still need some work on the uniforms, I'd want to work on a "political support" (kind of modified religion, but so far some technical constraints have been very frustrating). And I'd also like to rework the traits of the general. Also, is there anyone who you wish to thank in particular? Two actually. First l'Aigle, who started MoE with me, and I learnt from him how to edit the textures. I left the project too soon due to some RL issues, but fortunately I have learn enough to take over. And second Prince of Esslings, a never ending source of knowledge, who provided me with invaluable resources for uniforms (hundred of reference pictures), but also many other topics. Here we are Steph, once again many thanks for accepting to give this interview and best of luck for your doings here at TWC and in general for your life. A great pleasure to have had the opportunity to work on this interview with you! 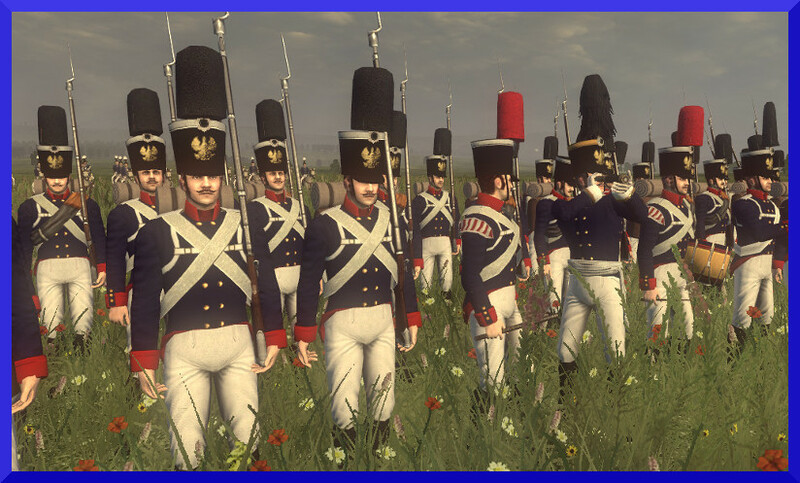 I enjoyed reading this, as a fan of the Napoleonic era, and the modding tips are excellent! Thank you, Steph and Flinn! I hope that Santa delivers what you asked for, Steph! Can't wait to read - have just got back into N:TW and once I've refreshed myself with the vanilla campaigns Masters of Europe is a mod I'm eager to try.